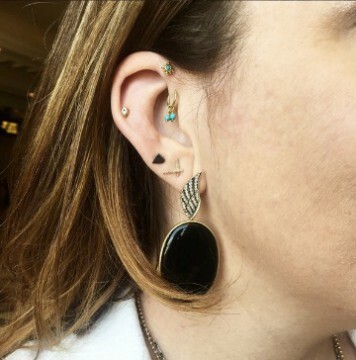 Thank you to Amanda Gizzi of National Jeweler for including my Cleves winged earrings in her post about black and gold jewelry! 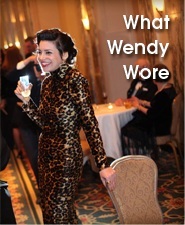 CLICK TO READ AMANDA’S STYLE FILE STORY. The earrings — inspired by Anne of Cleves, the fourth wife of Henry VIII — are onyx set in 18K yellow gold and accented with 41 points of diamonds (there are 100 points in a carat). 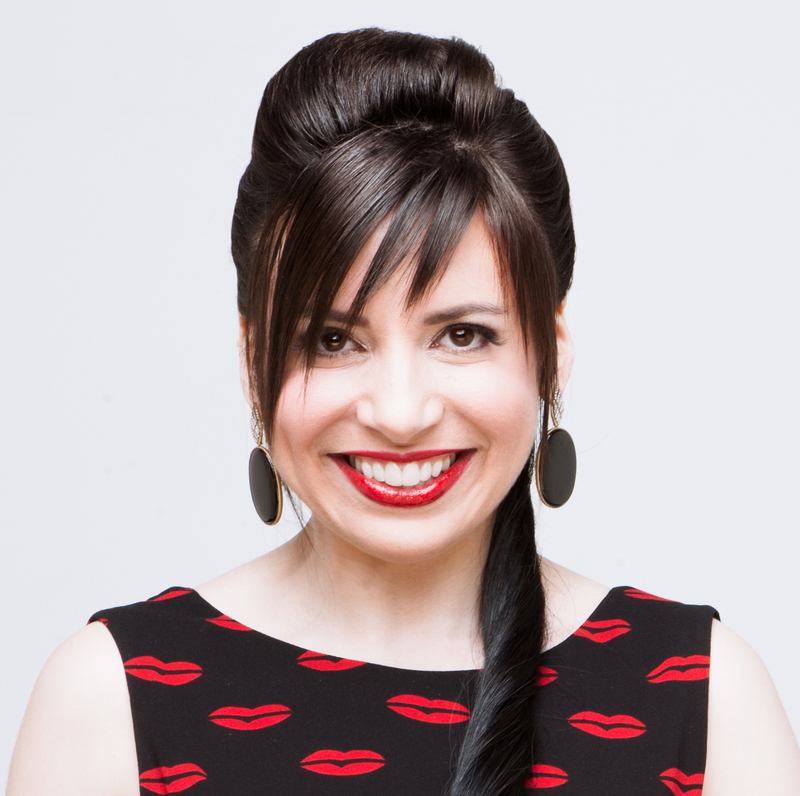 You can see one of the Cleves earrings on our friend Alyssa here. I like how the statement earring goes so well with the rest of Alyssa’s ear party. Check out all those piercings! 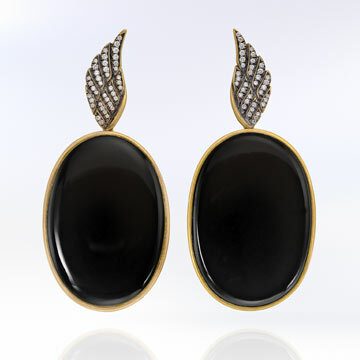 The earrings are part of a series of onyx pieces I did, all inspired by queens. 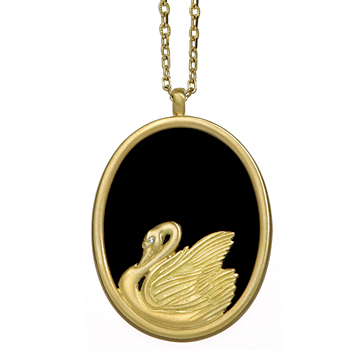 The first Cleves piece I did was a swan necklace. 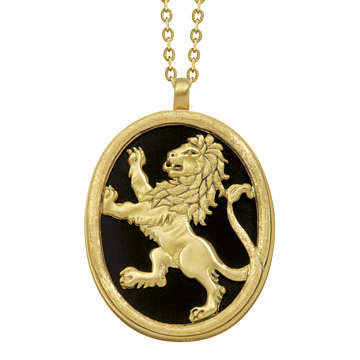 In 2007, I proved Anne of Cleves was a damn genius and therefore very deserving of good-looking jewelry. Read that post out here. Mary Queen of Scots was not a damn genius — unfortunately for her — but she’s still fascinating. 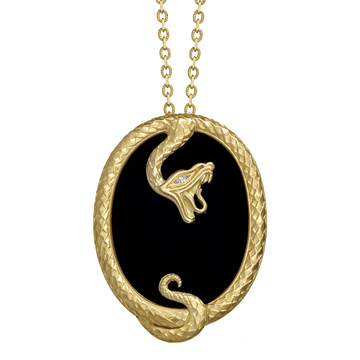 Click here to read about why she inspired a snake necklace (and earrings and, soon, a ring). Finally, my Eleanor necklace was inspired by Eleanor of Aquitaine, one of the most powerful women in Europe in the Middle Ages. Eleanor was the daughter-in-law of one of my favorite royals — Empress Matilda. 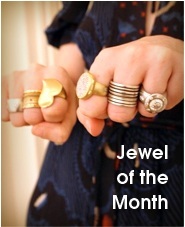 Don’t forget that I’ve got Matilda designs too! Don't Screw Around! Get Your Cyber Monday Earrings. Congrats! Of course, your earrings were my fav. amongst all the others. You certainly don’t skimp on the onyx. Or the gold!